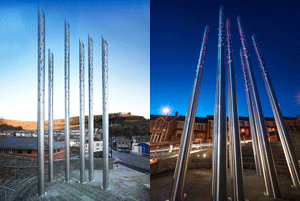 The Abertillery Gateway feature consists of six stainless steel spires which represent the historic locations of former colliery sites from the surrounding area. Each spire is illuminated with LED's to symbolise the glow of burning furnaces associated with the mines. m-tec manufactured the Super Satin finished stainless steel spires, which are 8mm thick with a diameter of 450mm. 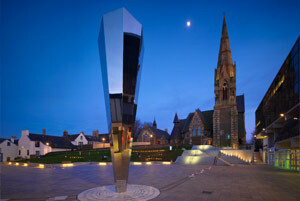 The spires also have stainless steel base plates engraved with the name of the colliery they are representing. As part of a competition, local schools were given the opportunity to produce sketches, poems or short stories to represent past and present memories. The winning designs were engraved onto 16 stainless steel plaques on the stone retaining wall. Check out this video showing our latest 14m high commemorative architectural stainless steel sculpture installed recently in Folkestone! This new stainless steel sculpture - called 'The Swirl' - has taken pride of place in the heart of an Oxfordshire Market Town. 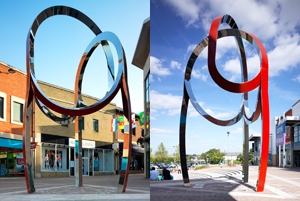 Designed by architect Maria Rosa Kramer, the Swirl sculpture is now turning the heads of locals and visitors to Didcot. Her striking work resembles the peeling of an apple and was inspired by Oxfordshire's great apple growing tradition. The Swirl was created for the Orchard Shopping Centre in the town and m-tec were commisionned for the fabrication and installation of this new work of art. The sculpture stands eight metres high and is supported by three vertical legs. Its fabrication is grade 316 stainless steel, which is mirror polished and it is finished with red paint on one of its faces to represent the colour of an apple. .
Have a look at our latest architectural Metalwork Project - This dramatic five-metre diameter world globe was fabricated by architectural metalwork fabrication pecialists m-tec in Darwen, Lancashire, and is the latest in a series of high-profile projects we have been commissioned to create. 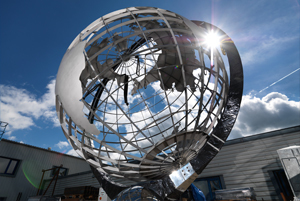 M-tec's stunning work can be seen in towns and cities across the UK â€“ but this is the first piece of architectural metalwork we have delivered to Africa. .
Have a look at our latest architectural Metalwork Project - The Trinity Mirror Sculpture - which was recently installed in Irvine Town Centre.. 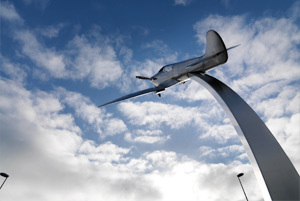 Please have a look at our Apprentices' latest project, the Darwen Spitfire Memorial Sculpture! 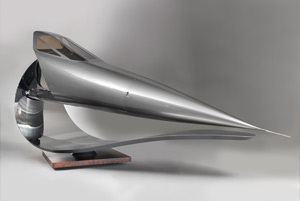 Please have a look at our latest project, the Concorde Nose Sculpture! 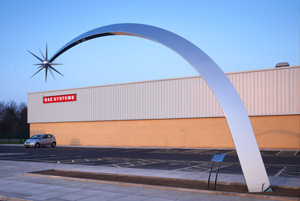 Please have a look at our latest project, the BAE Systems Airburst Sculptures! Fabricated completely from stainless steel, the bridge was installed in July and was opened to the public in August. Specialist architectural metalworking company m-tec, were chosen to fabricate the 60 metre structure. Weighing approximately 75 tonnes, the bridge is one of the most impressive structures of its kind in the UK. The bridge was made in 8 sections and delivered to site where it was constructed and installed. Lifting the bridge over the river was an impressive sight, as one of the largest cranes in Europe was tasked with lifting the bridge into place. With the bridge at its centre point over the water and suspended by the crane, the weight was approximately 1,500 tonnes! The stainless steel bridge is a small part of a multi-million pound development in the Temple Quay area of Bristol and m-tec are proud to be part of such an ambitious project.